KALAMAZOO, MI- The Kalamazoo Wings, proud ECHL affiliates of the Tampa Bay Lightning, have traded defenseman *Adam Phillips *to the Norfolk Admirals for *Nicola Riopel *, the team announced Wednesday. Riopel (ree-oh-pell), 27, joins the Wings after spending last season with the Rapid City Rush (two appearances) and the Norfolk Admirals (32 appearances). During those contests, Riopel posted a combined record of 13-17-1, with a goals against average of 2.66 and a save percentage of .920%. "He's (Riopel) on a Syracuse contract as part of the Tampa Bay Lightning system," head coach *Nick Bootland *said. "Both organizations thought it would be best that he develop in our system, and we're happy to have him doing just that." A native of Beloeil, Quebec, Riopel was drafted in the fifth round (142nd overall) by the Philadelphia Flyers in the 2009 NHL Entry Draft, and has played in the professional ranks since 2010, when he made his debut with the Adirondack Phantoms of the AHL. Throughout his first six seasons of professional hockey, the 6-foot netminder has logged 186 appearances across four leagues in three countries. He took an overseas stint from 2012-14 with Dundee of the EIHL and Rouen in France's top league. Throughout his career, Riopel has skated in 21 career AHL games and 97 in the ECHL (Greenville, Rapid City, Norfolk). Before turning pro, Riopel spent four seasons with Moncton of the QMJHL and became a household name across the league. During the 2009 season, Riopel set a league record with a 2.01 goals against average, which earned him the Jacques Plante Memorial Award as the league's top goaltender. During that season, he was also honored with the Michel Briere Memorial Award as the league's most valuable player, an accomplishment that had been previously won by players such as *Denis Savard*, *Mario Lemieux*, and *Sidney Crosby*, as well as former K-Wings *Manny Fernandez *and *Yanni Gourde*. Single-game tickets are on sale! Tickets start as low as $10 all season long and can be purchased at the Wings Event Center box office or at kwings.com . 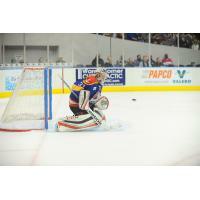 The Kalamazoo Wings host their 43rd annual home opener on Friday, October 21, as they entertain the Fort Wayne Komets. The game features a Fan Fest, a free event with your purchased ticket, which begins at 5:30 p.m. and features local food trucks, craft beer, games, and live music. 2016-17 season tickets are now on sale! Tickets can be purchased at kwings.com or by contacting a Kalamazoo Wings ticket sales representative. For more details on becoming a Kalamazoo Wings High Flyer, visit https://kwings.com/seasontickets.